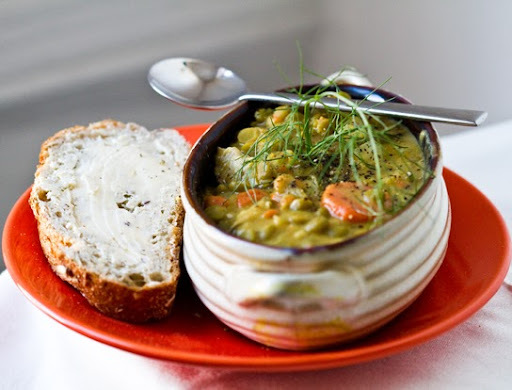 Is my warm bowl of Homestyle Vegan Pea Soup, served with a side of crusty wheat bread and vegan butter the best lunch ever?? OK, "best ever" is a strong statement - but right now as I dive in with my eager soup spoon, I have to say, this dish is a very worthy contender. Cheap (yummy, healthy) Lunch! I get so excited when I craft a recipe that is not only easy and restaurant-quality delicious, but also cheap! And yes, Split Pea Soup fits those qualities. I buy about 2 cups of dried organic split peas from Whole Foods (from the reasonably priced bulk-bin section), and I'm just about ready to make fantastic soup! Flavors. The liquid smoke adds a smoky layer that meshes perfectly with the warm 'cheezy' flavor of the nutritional yeast. Mushrooms, carrots and potato accents are perfect pea companions. ..if you don't have nutritional yeast, that's OK - but I highly recommend you try adding healthy nutritional yeast to your pantry! Healthy Peas. Peas are pretty much superheros when it comes to vegan nutrition. They are a great source of 100% vegan protein, fiber, and other assorted nutrients. They also fill you up and keep you going on a cold fall or winter day. ...and NYC has been pretty chilly and snow-covered lately! 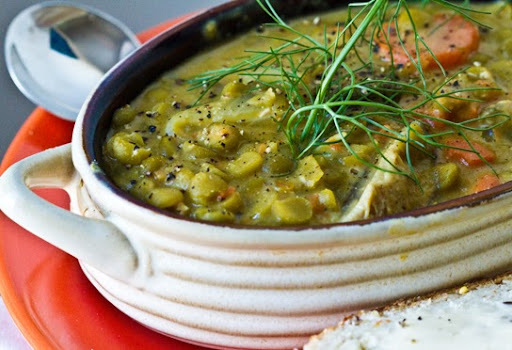 Crave this soup, then make it! garnish: fresh herbs like chopped dill, parsley, fennel fronds or cilantro. 1. Soak your dried peas in salted water overnight. 2. Add all your ingredients to a large soup pot. Bring to a boil. Reduce heat, cover pot with lid and allow to simmer for several hours. Be sure not to burn the bottom of the soup. 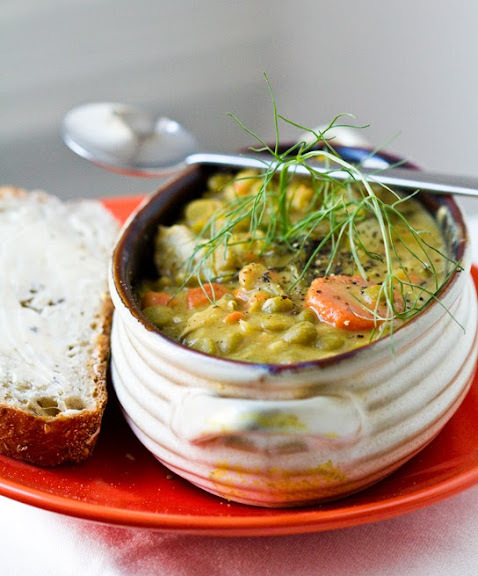 Pea soup burns quite easily - so monitor it closely if this is your first time making it. Low temperatures for a long period of time work best. You could also use a slow cooker if you'd like. 3. I actually enjoy my peas a bit al dente, but keep simmering until the peas are tender to your likeness. 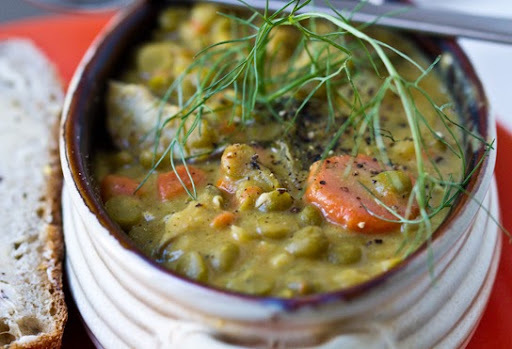 Serve same day, or for even better flavor results, allow the soup to sit in the fridge for 1-2 days and reduce and marinate the peas. Soup like this tends to be better the next day! 4. Simply reheat and serve. 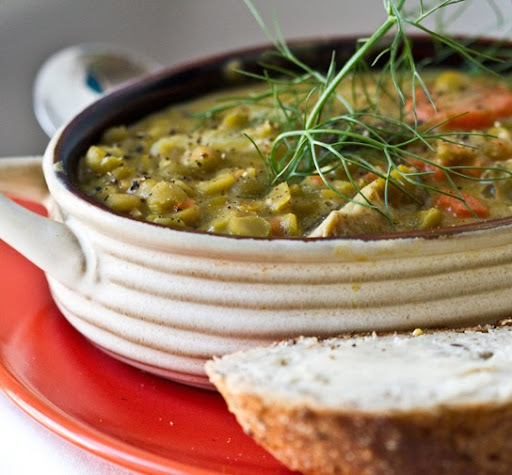 *remove bay leaf before serving* Crusty bread and vegan butter are the perfect side to this cozy bowl. Garnish with fresh herbs.